Avoid discoloration, odor and a buildup of bacteria by following these tips by Medora Dental Care on how to clean your Invisalign tray and achieve the best results possible while keeping your teeth and mouth healthy. Invisalign braces are one of the most popular and effective methods of straightening teeth currently available. 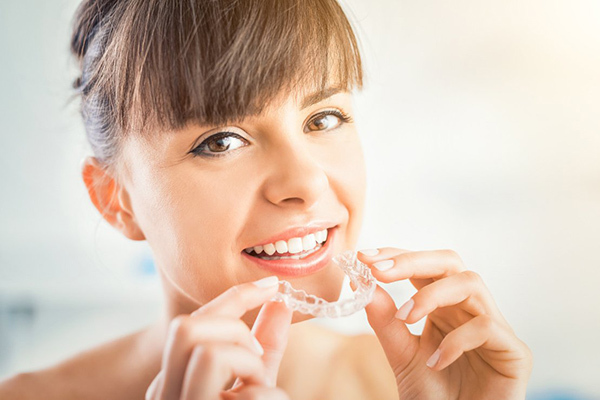 When you decide to get Invisalign braces in Abbotsford, it’s important to know how to keep your aligner trays clean so that you get the best results possible while keeping your teeth healthy and clean. At Medora Dental Care, we’re happy to answer all your questions and walk you through the needed steps to follow. Invisalign trays mould perfectly to your teeth, so any bacteria left in them can lead to tooth decay and bad breath. Brushing and flossing after every meal will ensure there are no food particles festering on your teeth, or in the aligner tray. It’s also a good practice to rinse your trays with warm water every time you remove them to clear off any germ buildup. When you eat out, bring along your Invisalign aligner case, travel toothbrush and floss. The extra work is worth it in order to have healthy, white, straight teeth. Drinking hot coffee or tea can stain and warp your Invisalign trays. A very hot beverage will melt the aligners and compromise their effectiveness. Regularly consuming sugary or alcoholic drinks can cause significant plaque buildup and will discolour your aligners as well. When wearing your Invisalign braces, stick with drinking cold water. If you do decide to drink anything besides water, remove your braces first. Afterward, brush your teeth and rinse your trays before reinserting them. After washing your hands, clean one tray at a time on both the inside and outside with a very soft toothbrush and mild, unscented soap. Toothpaste will scratch your aligners and make them more visible while you wear them. Rinse thoroughly with warm—not hot¬—water. 4. Ask About Specialty Products. Talk to your dentist in Abbotsford about what specialty Invisalign cleaning products are available. These come in the form of soaks, foams, tablets and crystals made specifically for your Invisalign aligners. They safely remove bacteria, stains and odours. Sticking to products recommended by your dentist ensures you don’t accidentally damage your invisible braces, making them unsightly or slowing down your tooth straightening progress. Invisalign is a great alternative to metal braces, and when kept clean, using them can result in a straight smile that you can feel proud of. Book a consultation with your family dentist in Abbotsford today to learn more.